Politically, culturally and economically, Makivik has led in the building and development of a vibrant region called Nunavik, occupying the top third of the province of Québec, within Canada, Inuit have established our own distinct place and identity. Makivik’s work demonstrates the extent that modern aboriginal treaties or comprehensive land claim agreements benefit all partners, governments and Inuit. It has demonstrated the ability to define new relationships between the governments of Québec, Canada, and a group of Indigenous peoples, in this case the Inuit of Nunavik. Since the late 1970s, Makivik has become a leader within Canada and the world in successfully combining aboriginal rights, political negotiation and business acumen into successful business and economic initiatives that contribute to the national, provincial and regional economies. The organization has overcome initial fears about the loss of aboriginal title and rights to traditional lands. By carefully investing compensation funds and utilizing selected Inuit “titled” lands it has demonstrated the extent land claims can influence and lead economic and resource development, political development, scientific and environmental research and community infrastructure investment. Makivik’s effective working relationship with federal and provincial governments over the years has been guided by committed leaders with consistent approaches in relation to land claims implementation and meeting the ideals of the land claim settlements. Since the initial claim was signed in 1975, Makivik and the Government of Canada concluded a 14-year process with the successful negotiation and creation of the Nunavik Inuit Land Claims Agreement in 2007. This agreement covers offshore areas and islands in the Hudson and Ungava Bay areas. Throughout its history, Makivik has recognized the importance of participating on the broader national political agenda. 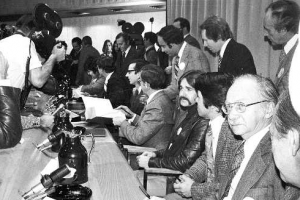 Nunavik Inuit were key players during constitutional negotiations in 1982 that affirmed Inuit rights in the Constitution of Canada and offered constitutional protection to comprehensive land claim agreements. Makivik continues to assert a strong national voice through the board of directors of Inuit Tapiriit Kanatami (ITK), the national Inuit organization. It has played a key role in developing positions for the First Minister’s meetings, including the Kelowna Accord in 2005, and the apology by the Government of Canada for its policy of “assimilation” associated with Indian Residential Schools, which affected Inuit in all regions of Canada. A core element in Makivik’s mandate is economic development and job creation. It recognizes first and foremost the economic future of Nunavik will continue to depend on renewable and non-renewable natural resources. In terms of non-renewable resources, Makivik is involved in ongoing negotiations and partnerships in both private and public sectors. These include on-going negotiations with Hydro-Québec on existing and proposed James Bay hydro-electric projects, and the mining company Glencore PLC regarding the Raglan Nickel Mine. Makivik is also responsible for investing and managing the funds obtained through these negotiations. The Corporation’s Renewable Resources Development Department operates a nationally recognized research centre in Kuujjuaq which carries out scientific research on wildlife, and the environment. Makivik also supports the hunting fishing and trapping associations in each community, as well as the landholding corporations which administer the lands owned exclusively by Inuit (Category l Lands). The five-member Makivik executive and 16 members of the board of directors (BOD) are elected by the Inuit residents of Nunavik. A two-member Board of Governors is appointed by the Executive and BOD to serve as a council of elders. The Inuit of Nunavik, through Makivik Corporation, are members of the national Inuit organization, Inuit Tapiriit Kanatami (ITK) and the international organization, Inuit Circumpolar Council (ICC).